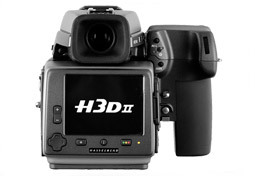 The Hasselblad H3DII-50 sensor features a very high resolution medium-format CCD with 51.7 Mpix manufactured by Kodak; a 16-bit Analog/Digital (A/D) converter; and an ISO range of 50 to 400. With respect to ISO sensitivity, the only real ISO provided is ISO 50 (measured sensitivity is 45). All other ISO values are obtained by applying a digital gain during the RAW-to-JPEG conversion, which is the same type of design as for the H3DII 39.